Front features the King's X "XV" Logo. Back of shirt reads "Go Tell Somebody" along with tour dates from their 2008-2009 North American tour. Front features the King's X "XV" album cover artwork. Printed in vintage "distressed" style. Back features the "King's X" Logo in green and white. Front of sweatshirt also has zipper, two pockets, and drawstring for hoodie. No assembly required. 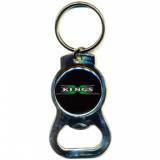 Keep your favorite canned beverage cool with these fabulous King's X koozies. King's X logo (printed in white and green) is printed on both sides. Whether you're preachin' from the pulpit or committing some heinous deed, look stylish while sporting your King's X Lapel Pin. Features the classic King's X logo in green with white lettering. Actual size is 2" (length) x 0.5" (height). These clever contraptions can both hold your keys and open bottles of your favorite beverages. Be the envy of your friends and enemies as you tote your things with this King's X bag. With festive green colors, this tote bag can also be hung on your mantle as an extra large Christmas stocking. Can also be used to hold lots of Molken Music CDs and DVDs. Save the planet and bring your environmentally friendly King's X shopping bag with you on your next trip to the grocery store. This bag also has a sturdy, reinforced bottom so if you only get a loaf of bread, it won't get all smushed.